Hi. A few minutes ago, I received an email about an update to version 5.56 of CCleaner (free version), I downloaded it from https://www.ccleaner.com and tried to install it with no luck. 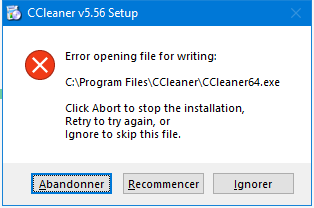 I got an error message saying "Error opening file for writing: C:\Program Files\CCleaner\CCleaner64.exe. The same error occurred when I tried to install version 5.55 as well. Any suggestions please? Thanks in advance! the latest update does not work. why doesn't someone do something about it? Is this expected quality? I have downloaded your popup 4 times. Failed each time. Why do you keep sending it if it doesn't work?